Join the discussion on our forums! Come discuss Hot Spring Guardian over in our dedicated Hot Spring Guardian discussion topic. What an adorable elemental. It's going to be so big and strong one day. This card is almost pick-on-sight in Arena, second only to something like Lightning Storm, and in Constructed it will be ubiquitous. Why, blizzard? Why does Shaman get blatantly over-curve minions every expansion? 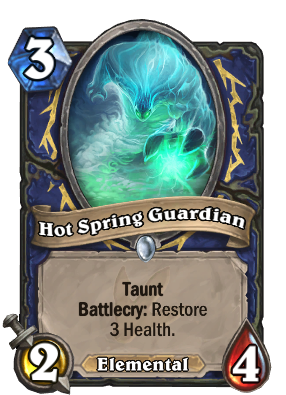 Isn't it Shaman's turn to get shafted like Warlock was in TGT or Paladin and Hunter were in Gadgetzan? Why does Shaman get all of the good healing cards? I wish this was just a neutral card, though it could be seen as powercreep over Earthen Ring Farseer. I just wish a class like Rogue or Paladin had access to it. Rogue doesn't have Healing within it's purview, I wish people would understand that. Asking for Rogue to get a card like this is like asking for a Hunter to get it; it just doesn't make sense in the class. Shaman actually IS a healer class in WoW. That's why it has all the good healing cards. Except Paladin and Priest, who have some better pure healing cards. Looks to be extremely solid. I want to play control shaman now. ...where's the overload on this? Like seriously, this is straightup powercreep on a lot of cards. Why even run Feral Spirit against aggro if you cna just run this? Shh don't complain, this is the only way they can give shaman good cards without them being aggressive. I'd much rather have a mini emperor and this card than a trogg and a totem golem. Congratulation, you have a nice annoying deck against aggro who don't lose too much against slower decks. Aggro will definetely have hard times with all these taunts and heals in this expansion.